*HOT! 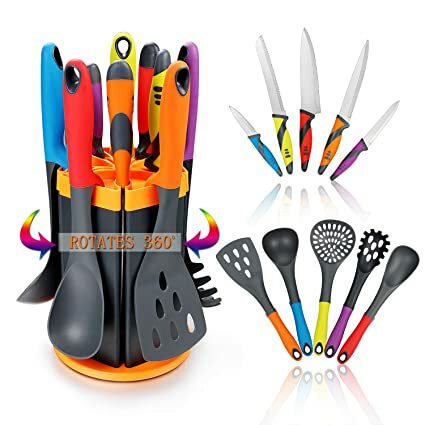 * Amazon – Cooking Utensils Set & Kitchen Knife Set – 5 Piece Nylon Nonstick Kitchen Utensil Set & 5 Piece Cook Knife Set with Rotating Knife & Utensil Holder just $18.99 after Code (Reg $37.99) + FREE Shipping! PESACH! Nice set for PESACH! Score the Cooking Utensils Set & Kitchen Knife Set – 5 Piece Nylon Nonstick Kitchen Utensil Set & 5 Piece Cook Knife Set with Rotating Knife & Utensil Holder on Amazon for $37.99 – 50% ($19) with promo code 5QD5N695 = just $18.99 with FREE shipping!